In Sanskrit, vajra refers to Indra’s thunderbolt (Indra is known as the king of the Gods). Therefore, vajra asana is called the "thunderbolt pose." The term vajra can also be translated as "diamond," so this posture is also often referred to as the "diamond pose." 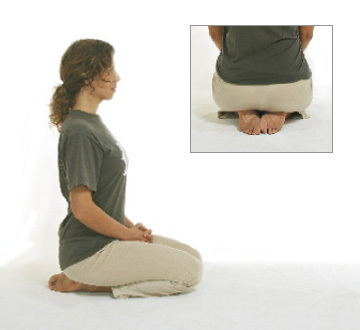 Begin by kneeling with your body fully upright. Bring both knees together as well as both your feet and heels. Sit down on your heels so that they are pressing directly into your buttocks. Keep your spine straight with your head and neck in vertical alignment with your spine. Note: This is utthitha vajra asana, or the fully upright vajra asana. Though vajra asana is not a dangerous position, due to modern lifestyles many people have an extreme lack of mobility in their knee and ankle joints, with a lot of tension throughout the legs and may find initial difficulty in assuming this position. If this posture is uncomfortable in the beginning, try to maintain it for as long as you can, even if only for a few seconds. Do not over-push yourself. When there is pain or cramping, rise up onto your knees for a few moments until it subsides, and then resume sitting. The compression of the leg muscles that occurs in vajra asana partially inhibits the blood from flowing through the legs, which sends a greater volume of blood to the abdominal organs. Therefore, vajra asana has been found useful for many problems in the abdominal organs, particularly the digestive organs. This asana has a unique feature, in that it can be practiced at any time, even with a full stomach and right after meals. The great yogis even advise that we should do so. It is even recommended to sit in vajra asana while eating, which, together with practice immediately after the meal (for up to 30 minutes), will aid digestion.